8511 E Garden Oaks Circle Palm Beach Gardens, Fl 33410 has been sold. You can view available homes in Garden Oaks. THIS GATED 3 BEDROOM, 3 BATH PLUS DEN OR FORMAL DINING ROOM W/ FRENCH DOORS HAS PRIVATE BACK YARD, 28 X 16 POOL W/ SHELF WATERFALLS & JACUZZI. MANY FEATURES FOR THIS MOST DESIRABLE EXTENDED CARMEL MODEL INCLUDES 2017 ROOF, 2018 AC UNIT, 2015 HOT WATER HEATER, POURED CONCRETE CONSTRUCTION BUILT BY DIVOSTA, NEWER KITCHEN APPLIANCES, GAS POOL HEATER & GRILL, HIGH CEILINGS, SLIDING DOOR & PATIO OFF KITCHEN, CENTRAL VACUUM & LOW HOA FEES. THE MASTER SUITE HAS HIS & HER BATHROOMS W/ SEPARATE SHOWER, TUB & CLOSETS. STREETS LINED W/ BEAUTIFUL OAK TREES THROUGHOUT! THE HOA FEE IS $800 IS PAID QUARTERLY. THAT INCLUDES FRONT YARD CARE (SHRUBERY, FERTILIZER SOD), 24 HOUR MANNED GATE,TENNIS COURTS & COMMUNITY POOL. OPTIONAL $75 PAID QUARTERLY FOR BACK YARD. 8511 E Garden Oaks Circle located in Palm Beach Gardens, FL is a single family home with 3 bedrooms, 3 full baths and 0 half baths.The Home at 8511 E Garden Oaks Circle was built in 1994 in Garden Oaks and offers a 2 car garage. This Garden Oaks Home offers pool, tennis, sidewalk, street lights. 8511 E Garden Oaks Circle Palm Beach Gardens, Fl is currently listed for $390,000 under the MLS# RX-10478396. 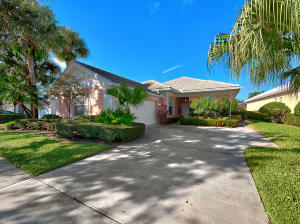 This Home has been put on the Palm Beach Gardens MLS system and currently has a status of SLD. Information in regards to Palm Beach Gardens real estate and Garden Oaks Homes for sale or any other areas may have come from a cooperative data exchange service. All rights reserved. Information deemed to be reliable but not guaranteed. The data relating to real estate for sale on this website comes in part from the IDX Program of the Florida Regional MLS. Listing broker has attempted to offer accurate data, but buyers are advised to confirm all items. We provide all information about Palm Beach Gardens Homes for sale and Garden Oaks real estate and all other site listings as is with absolutely no warranties. This site will be monitored for 'scraping' and any use of search facilities of data on the site other than by a consumer looking to purchase real estate, is prohibited. Feel free to contact our agents to find a great Garden Oaks Palm Beach Gardens specialist.